Immunodeficiency-centromeric instability-facial anomalies syndrome (ICF) is a rare autosomal recessive (AR) primary immunodeficiency (PID) characterized by a profound hypogammaglobulinemia with characteristic rearrangements in the proximity of the centromeres of chromosomes 1, 16, and occasionally 9 in mitogen-stimulated lymphocytes. Other variable symptoms include characteristic facial dysmorphism, growth retardation, failure to thrive, and mental retardation. The main immunological defect is the lack of CD19+CD27+ memory B cells while B cells are usually present. Serum immunoglobulins are variably low. There are limited data on T-cell function; however, in reported cases T cell function is severely impaired. These patients suffer mainly from recurrent or chronic bacterial respiratory infections as presenting symptoms. Bronchiectasis, gastrointestinal and skin infections are also common from early childhood. According to the severity of the concomitant T-cell defect, opportunistic and severe viral infections may be present. In several cases, autoimmune manifestations and malignancies can also be part of the clinical spectrum (Ehrlich et al. 2006; Sterlin et al. 2016). Patients with immunodeficiency-centromeric instability-facial anomalies syndrome (ICF) are of diverse ethnicity, mainly European, Turkish, Japanese, and African American. Although consanguinity has been noted, most cases are not familial, and the prevalence is less than 1 in 1,000,000 (Ehrlich et al. 2006). ICF is a rare AR disease, first described in 1978. There are three different forms (ICF1 to 4) recognized and linked to specific genetic defects with distinct clinical features. All forms are characterized by the branching of chromosomes 1, 9, and 16 after phytohemagglutinin (PHA) stimulation of lymphocytes. The underlying abnormality is linked to abnormal hypomethylation of juxtacentromeric heterochromatin repeats (Velasco et al. 2014). This is similar to what is observed after treatment of cells with demethylating agents. In recent years, the number of disease genes has expanded from 1 to 4, there are still cases left unexplained. The most common type is ICF type 1 is the biallelic mutation of deoxyribonucleic acid (DNA) methyltransferase B (DNMT3B) on chromosome 20q11.2 found in approximately 50% of the patients. DNMT3B as a de novo DNA methyltransferase acts during early cell development with a preference for CpG dense regions, so ICF1 mutations in the catalytic domain of DNMT3B result in a largely reduced methyltransferase activity and hypomethylation of regions that should be active during lymphocyte development. These cases most often carry missense partial loss of function mutations (Sterlin et al. 2016; Velasco et al. 2014). Thirty percent of patients have ICF type 2 with biallelic deletion in the ZBTB24 gene on chromosome 6q21, that belongs to a zinc finger and BTB domain family of transcription factors responsible in B cell differentiation. The biallelic missense mutation of ZBTB24 strengthen the hypothesis that ICF2 patients suffer from a ZBTB24 loss of function mechanism and confirms that complete absence of ZBTB24 is compatible with human life. This is in contrast to the observed early embryonic lethality in mice lacking functional zbtb24 gene (van den Boogaard et al. 2017; Velasco et al. 2014). In the remaining 20% of ICF cases, two more genes are involved acting in converging pathways leading to the ICF phenotype. ICF3 has been described with mutation in cell division cycle associated 7 (CDCA7) genes, while ICF4 is a compound heterozygous or homozygous mutation of the helicase lymphoid-specific gene (HELLS) (Sterlin et al. 2016). The diagnosis of ICF on the basis of cytogenetic hallmarks occurs at a median age of 5.2 years (range: 1 month to 11.4 years). Life expectancy is poor. In a study of 45 patients, 40.5% died. Cause of death were predominantly severe respiratory tract infections, sepsis and failure to thrive, with a median age at death at 8 years of age (range 6 months to 42 years) (Hagleitner et al. 2008). Based on a recent French national cohort study (Sterlin et al. 2016), the first clinical signs of ICF syndrome, mostly recurrent infections or a failure to thrive, occur at a median age of 4 months (range: 1–12 months). Hypogammaglobulinemia was diagnosed at a median age of 3.3 years (range: 2 months to 11 years). ICF syndrome is characterized by recurrent severe respiratory, gastrointestinal and skin infections. Gastrointestinal problems are commonly seen at initial presentation with history of several episodes of acute or chronic diarrhea. The combination of gastrointestinal complications and recurrent respiratory infections imply poor prognosis. Failure to thrive is often related to chronic diarrhea. In some cases, nodular gastritis or colon stenosis in association with CD3+ lymphocyte infiltration have been described. The spectrum of infections range from chronic bronchitis, pneumonia, otitis media (often caused by Streptococcus pneumoniae), and sepsis to meningitis/encephalitis with main causative organisms including Staphylococcus aureus, Pseudomonas aeruginosa, and Klebsiella species. Severe infections with Candida albicans and Pneumocystis jirovecii reflect a component of T cell defect. Infections are the leading cause of death occurring mainly before immunoglobulin replacement therapy is implemented (Sterlin et al. 2016). The facial anomalies are typical: high forehead with frontal bossing, hypertelorism, epicanthus, broad flat nasal bridge, low-set ears, macroglossia with some other possible abnormalities, including hyperpigmented spots, microcrania, micrognathia, sparse hair, short limbs, and hypospadias. Delayed growth and mental retardation are typical and common for ICF type 2 wheres ICF type 1 patients present as slight cognitive and motor developmental delay in the first few years of life. In ICF type 2 cortical atrophy, generalized tonic-clonic seizures can develop within the first years of life (Ehrlich et al. 2006; Sterlin et al. 2016; Hagleitner et al. 2008). Autoimmune and immune-mediated manifestations include autoimmune hepatitis, arthritis, synovitis, nephritis, thyreoiditis, and psoriasis (Sterlin et al. 2016; Hagleitner et al. 2008). Malignancies: Hematologic malignancies (myelodysplastic syndrome, acute lymphoblastic leukemia, Hodgkin disease) are reported. Acquired cytopenias, including thrombocytopenia can be detected in several cases (Hagleitner et al. 2008). ICF is diagnosed by standard metaphase chromosome analysis of phytohemagglutinin-stimulated peripheral blood lymphocytes from patients (Maraschio et al. 1988) Fig. 1. Classical findings include multibranched chromosomes with whole-arm deletions and pericentromeric breaks of chromosomes 1 and 16 and rarely 9; where three or more arms of chromosomes 1 and 16 joined in the proximity of the centromere (mostly at the 1qh or 16qh region). 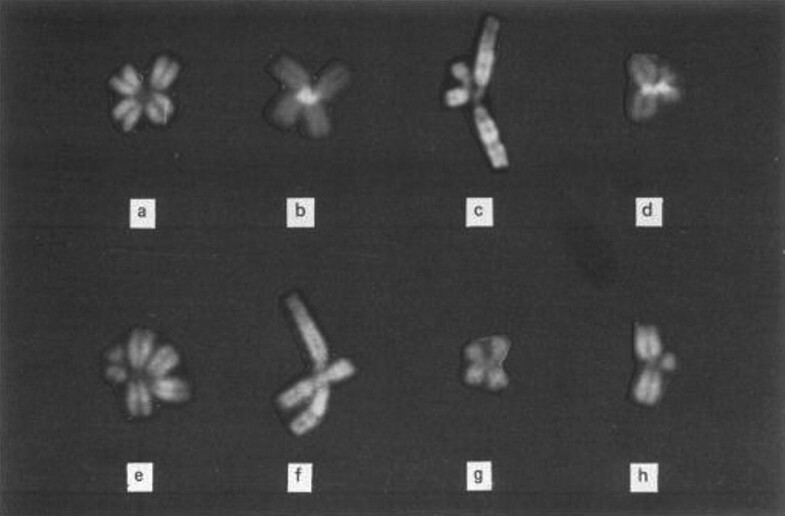 Occasional isochromosomes and translocations with breaks are in the vicinity of the centromere. In addition, prominent stretching in the 1qh and 16qh region is seen. Stimulation with pokeweed mitogen produces similar anomalies. In most, but not all patients, chromosome 1 is affected more frequently than chromosome 16 (Ehrlich et al. 2006; van den Boogaard et al. 2017). B cell immunity is severely impaired in all patients. Serum levels of isotypes (IgG, IgM, IgE, IgA) are variable, low level of IgA is associated with gastrointestinal problems mostly diarrhea. While naive flow cytometry studies reveal the absence of CD27+ memory B cells against normal circulating B cell count and can explain severe hypogammaglobulinemia. In vitro B cells might show a weak or no response to CD40L activation and are more prone to undergo apoptosis. This B cell abnormality is more severe in ICF1 than in ICF2 patients. The absence of specific antibodies against recall antigens is typical in both type. In some cases, there is a decrease in CD4+ and CD8+ T cell counts. CD45RA+CD31+ recent thymic immigrant cell count is always low, naive CD8+ T-cell count is usually preserved. Lymphocyte proliferation to PHA stimulation is normal by contrast low levels of T cell proliferation can be seen in response to antigens such as candida and tetanus toxoid (Sterlin et al. 2016). In case of autoimmune hepatitis, histology of liver biopsy is notable for infiltration of the portal area by inflammatory cells, including a few macrophages and CD8+ T cells (Sterlin et al. 2016; Hagleitner et al. 2008). The long-term outcome can be improved by immunoglobulin replacement therapy and antibiotic prophylaxis, that control well infectious complications (Sterlin et al. 2016). In case of severe autoimmune complications, immune modulation is indicated that can negatively impact outcome (Sterlin et al. 2016). Alternative therapy for autoimmune cytopenias may include allogenic hematopoetic stem cell transplantation (HSCT) with an HLA identical sibling donor can be an experimental therapeutic option, conditioning regimen usually contains treosulfan, fludarabine, and thiotepa. (There are centers using alemtuzumab, fludarabine and melphalan containing regimens.) Long-term follow up data after HSCT are not available. ICF1 patients usually need iron supplementation while ICF2 has not shown this feature. ICF2 patient often require anticonvulsive treatments and education at a specialized institution because of severe progressive mental defects, while almost 70% of ICF1 patients have normal intelligence or mild deficit (Hagleitner et al. 2008).